The US military is returning to the era of “Don’t Ask, Don’t Tell”, as new rules that will ban most openly transgender people from serving came into effect on Friday. Troops and LGBT+ groups said the new policy would force trans military members to choose between transition and their job and result in increased stigma and mental health issues. “With the implementation of this transgender military ban, our nation is once again shamefully forcing brave American heroes to hide who they are in order to serve,” Ashley Broadway-Mack, president of the American Military Partner Association, said. The Department of Defence said not all trans military members would be affected. “The military provides all necessary medical care to protect the health of our service members, including those who are in the process of being separated,” a spokeswoman said. 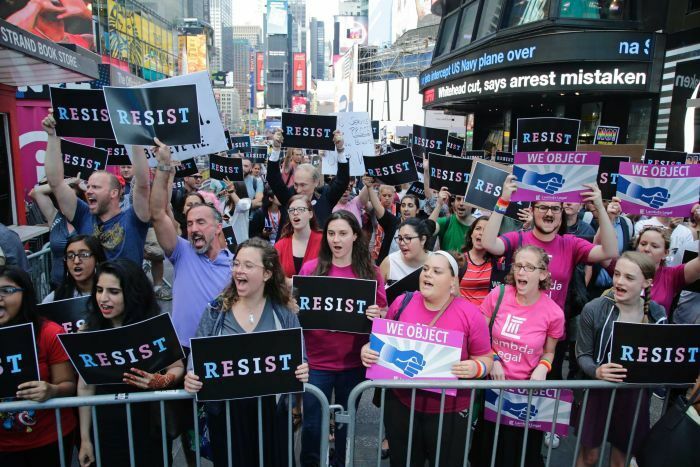 LGBT+ organisations are fighting the new rules in the courts, arguing they violate trans Americans’ constitutional rights, including equal protection under the law, due process and freedom of expression. “When this policy is examined closely there is no justification that could possibly explain what the government is doing,” Peter Renn, from law firm Lambda Legal, said. More than 10,000 transgender people may be serving in the US military across active service and reserves, according to a 2016 study by think thank RAND Corporation. President Donald Trump reversed the decision, claiming that trans people caused “tremendous medical costs and disruption” to the military. There are multiple medical and surgical options for trans people, including hormones, therapy and surgical gender reassignment, although non are compulsory and are highly individual choices. But it allows members of the armed forces who were diagnosed with gender dysphoria during the Obama administration’s policy to remain in the military and serve according to their gender identity. “He’s like ‘I’ll hold out and hopefully they will change the policy back’, and it’s hurtful because I know that he will eventually get to a point where he can’t suppress it like I did for so many years,” she said. Studies suggest there are likely to be thousands of trans troops who have not disclosed their identity and will be forced to choose between their career and living openly, Blake Dremann, of the SPART*A organisation for trans military members, said. Jillian Scheer, a postdoctoral research fellow at Yale University, said the policy was likely to cause increased anxiety, depression and suicidal feelings among trans service members and could also lead to a spike in stigma and abuse of trans people in wider society.